Research at the Water Canyon Paleoindian site began with the initial documentation of the site in 2001 by Escondida Research Group (Dello-Russo 2002). Subsequent, and more sustained, investigations began in the spring of 2008, and then continued during both the spring and the fall of 2009 (Dello-Russo 2010), and during spring field sessions in 2010, 2012 and 2013. 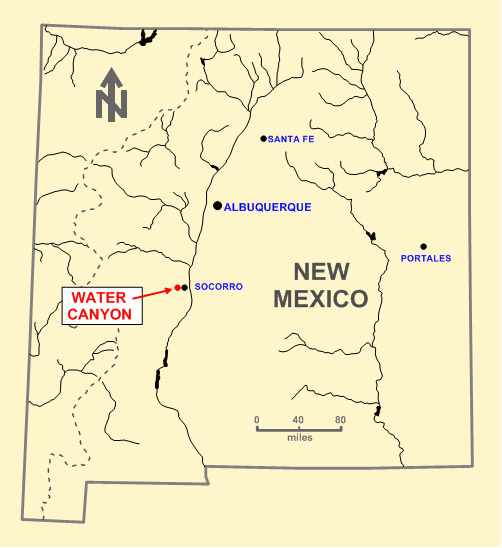 The Water Canyon site (LA134764) is located in west-central New Mexico (Figure 1), on lands managed by the Energetic Materials Testing and Research Center (EMRTC), a division of the New Mexico Institute of Mining and Technology, Socorro, New Mexico. As such, the property on which the site is located has restricted public access. The site is found at the east edge of the Water Canyon basin, among a series of dissected ridges formed by short tributaries of Water Canyon. 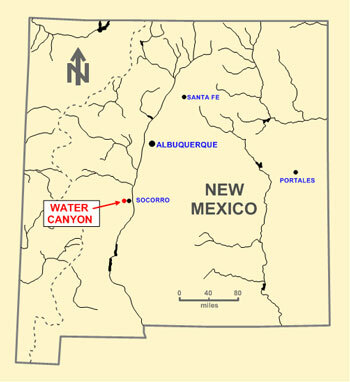 The main branch of Water Canyon heads in the Magdalena Mountains to the west. As the waters issue eastward along the Water Canyon drainage, they encounter the flanks of the Socorro Mountains and turn abruptly to the north, meeting Nogal Canyon which then drains eastward through the Socorro Mountains to the Rio Grande. The Water Canyon site is one of a series of early-to-middle Holocene age archaeological sites eroding out of sediments along the Water Canyon drainage at the toe end of a large alluvial fan that flanks the Magdalena Mountains. 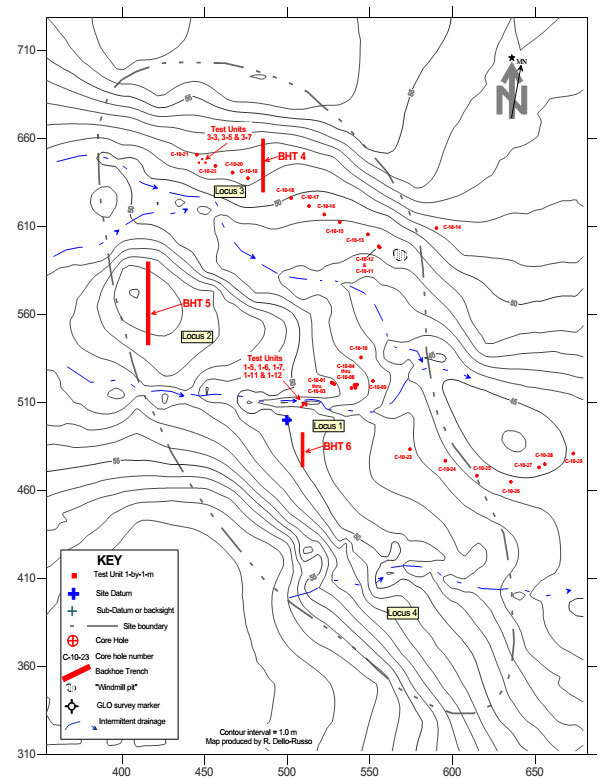 The site, as originally documented in 2001, covered an area of approximately 3250 sq m, and is located on a northeast-facing, gentle hill slope immediately above a small intermittent drainage (now referred to as “No Name Arroyo”) that trends from the west-northwest to the east-southeast (Figure 2). The site is found at an elevation of approximately 1760 m (5780 ft) in a juniper savannah vegetation community. As originally documented and interpreted, the site consisted of a small, open, flaked stone artifact scatter representing the remains of both a Late Paleoindian (Scottsbluff / Cody Complex) occupation (11,600-8785 calendar years before present [cal yr BP]; Knell and Muniz 2013:13) and a possible Middle Archaic (San Jose) occupation (ca. 5000-3800 cal yr BP) during which hunting-related and processing-related activities were undertaken. To the north and west of the original site boundary was also an extensive lens of organic-rich sediment exposed in an arroyo wall (Dello-Russo 2002:12, 50) (Figure 3). The suggested early Holocene age of the deposit was based on an extrapolation of geomorphological work reported by Machette (1988) in a portion of the Water Canyon basin adjacent to the Magdalena Mountains (along the Magdalena Fault). During a 2008 site visit we reiterated the 2001 hypothesis of an early Holocene or even late Pleistocene age for the organic-rich lens based on development of the surface soil formed in sediments that buried the lens. The dark color of the soil plus hints of iron reduction below also suggested formation in moist conditions with high biological productivity. The wetter paleo-conditions further suggested some antiquity to the darker zone. Four radiocarbon samples from the dark lens yielded ages (top to bottom) of ~8700, ~10,460, ~11,155 and ~13,025 cal yr BP. This confirmed the interpretation that the soil formed from the latest Pleistocene into the early Holocene. Further, the dating of the soil and the presence of the bone raised the possibility that in situ Paleoindian archaeological materials could be present. At the start of the 2009 field season, small exposures of the dark gray deposit and iron-stained sediments were noted both downstream and slightly upstream of the original exposure. 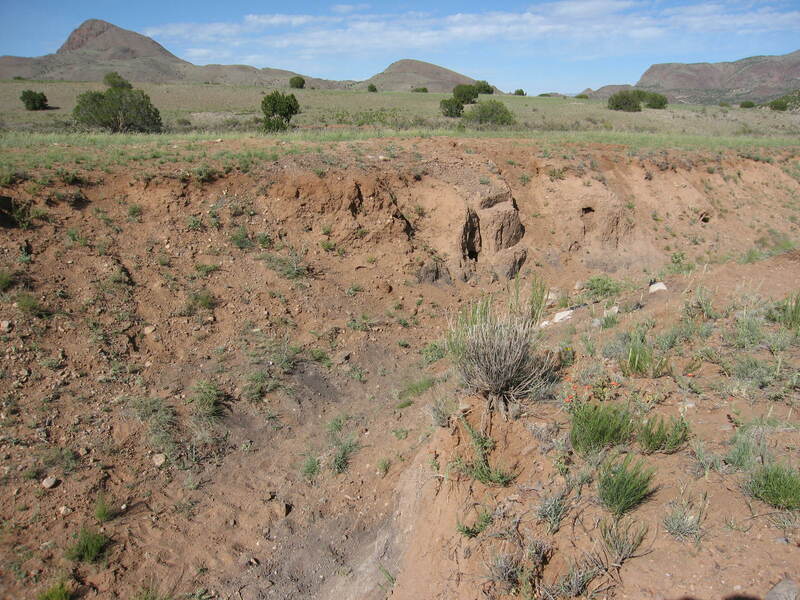 These exposures provided additional clues indicating that the highly organic buried soil was, in fact, part of a buried wet meadow deposit (Dr. David Love, NM Bureau of Mines, personal communication).. Over time, the buried wet meadow deposit has come to be referred to as the “black mat”, partially as a short-hand referent, and largely in deference to the significant background research on the subject completed by C. Vance Haynes (2008). From the 2008 - 2009 testing efforts we now know that the site (as defined by the mapped extent of the surface artifacts) encompasses approximately 72,000 sq m or 7.2 hectares (17.8 acres) and comprises at least four artifact concentrations, including Loci 1, 2, 3 and 4. Locus 4 represents the site as it was originally recorded. Additional diagnostic artifacts have been recovered from the surface of the site, including the base of a Clovis point in Locus 3 and the mid-section of a Late Paleoindian point (or possible knife?) in Locus 1 (the area yielding the first radiocarbon samples (Figure 4). The black mat was revealed to be a landscape-scale feature that extends well beyond the current boundaries of the site. Radiocarbon dates on charcoal and organic bulk sediment samples revealed that the black mat was extant, seemingly continuously, from the Late Pleistocene into the middle Holocene, and spanned the Clovis period through the Folsom, Late Paleoindian and Early Archaic period . It was unknown, at that time, if the deposit is older than Clovis. The bones recovered from the wet meadow deposit were thought to 1) come from Bison antiquus (occidentalis? ), 2) date stratigraphically to the Late Paleoindian period and 3) be spatially associated with lithic artifacts. 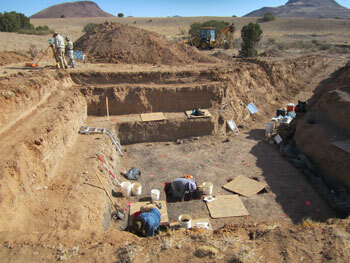 The 2010 field season occurred during approximately one week under very high temperature conditions (Dello-Russo 2012). We dated a section of the bison femur (FS 1037) from Locus 1. The collagen in this sample dated to a 14C age of 8200±40 BP (ca. 9052 cal yr BP). Additional faunal material was encountered by mechanical coring and found to be buried deeply (at ca. 3.7 m below the surface) in Locus 5. Although, as of 2010, no artifacts had been recovered in this area, the mean 14C date from Core 10-01 of 9718 ± 33 (11,096-11,225 cal yr BP), for two sediment samples surrounding the bone, suggests the presence of a second kill and processing event at the site. In 2012, the focus of our efforts in Locus 1 was to further examine the potential for early Holocene charcoal (thermal features or upslope forest fires?) and for other lithic tools and diagnostics in possible association with bison bones. Adult Bison antiquus bones, in a relatively high density, were discovered in the more eastern units of the excavation block. Although some of the bones were removed intact, others that exhibited green bone fractures required plaster jacketing. We have now identified the remains of one adult and one juvenile Bison antiquus in Locus 1. We completed a systematic OSL dating effort in Backhoe Trenches 4, 5 and 6 to continue to clarify the tempo of sediment deposition across the site, but particularly in Loci 1, 2 and 3. 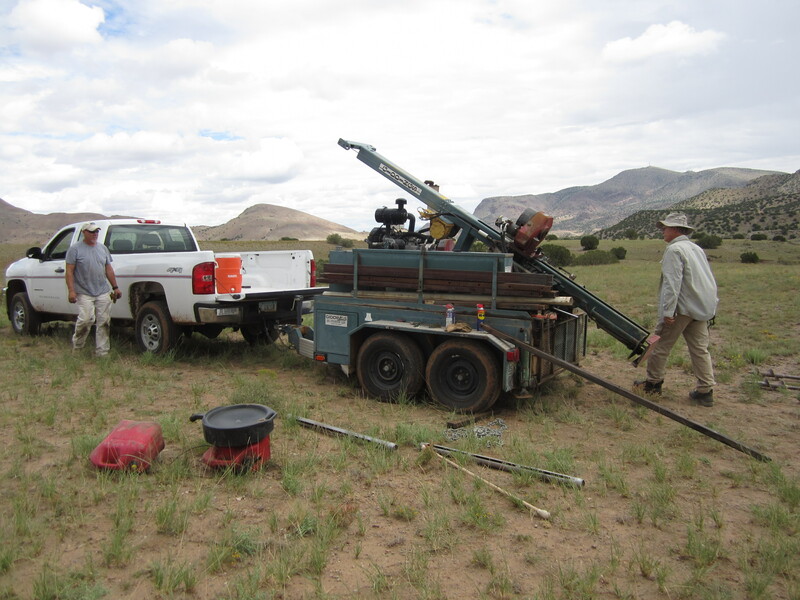 We continued to systematically recover pollen samples at the site, either from mechanical cores and/or from hand-excavated exposures of Late Pleistocene sediments below the level of the active channel in No Name Arroyo (Locus 1). We also continued to collect sediment samples for chronometric dating and to test for the presence of paleobotanic proxy materials [pollen, phytoliths, diatoms, shell material (e.g. ostracods, gastropods), mollusks, fossil insects, macrobotanical specimens and faunal elements, including tooth enamel (for stable carbon isotopes)]. During the course of the coring effort (Figure 5) we again encountered mammal bone samples at about 3.8 m below the surface in the area to the NE of Locus 1. This area is now designated as Locus 5. 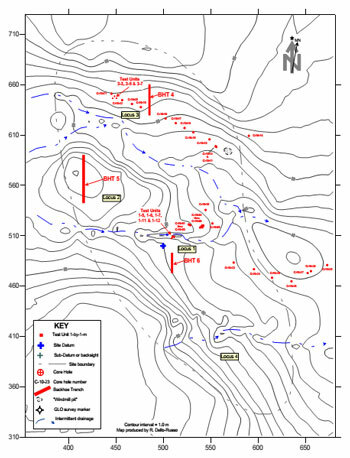 Excavation efforts during the 2013 session focused solely on buried deposits in Locus 5 (Figure 6). To remove approximately 500 cu m of Holocene sediment overlying the buried bones seen in mechanical cores, we utilized a large track excavator and a backhoe. We soon found that the buried bone deposit sloped downward from the southwest to the northeast. In the southwestern corner of the grid, a resharpened Eden (Late Paleoindian) point was recovered in direct association with the bone bed, potentially supporting early Cody Complex dates for that deposit. Additional OSL samples were taken from the Holocene overburden in Locus 5. We believe that the site, since the late Pleistocene, has undergone a series of erosion events that incised older terrain and created paleo-channels followed by depositional events where sediments filled those same channels. These events (delivery and removal of sediments; incision and in-filling of paleo-channels) were likely controlled by changing hydrological regimes (rainfall, snowfall on the Magdalena Mts., and snowmelt run-off). These hydrological regimes also controlled the rising and falling water tables and, ultimately, the development of the wet meadow deposit. Because of the ubiquity of the black mat throughout and downstream from the site, its thickness (up to ~100 cm), and the presence landslide debris below the site, one hypothesis is that a late Pleistocene slope failure temporarily dammed water, thereby helping to form the black mat during a period of a high water table (David Love, personal communication). Senior Crew: Dr. Robert Dello-Russo (Principal Investigator), Rusty Greaves (Field Director, Faunal Specialist), Dr. Vance Holliday (Soils, Geoarchaeology), Susie Smith (Pollen Specialist), Patrice Walker (Field Director) and Dr. Steve Hall (Soils, OSL). Office of Archaeological Studies: Nancy Akins, Matt Barbour, Tom Ireland, Steve Lakatos, Steve Lentz, Sheila Martin, Tim Maxwell, Pam McBride, Steve Post, Judi Powell, Don Tatum, Dr. Wolky Toll, Rob Turner (report and poster preparation) and Karen Wening. University of Arizona: Leslie Aragon, Lindsay Bishop, Dr. Vance Haynes, Eric Heffter, Jennifer Kielhofer, Annie Martin, Ariel Myers, Jill Onken, Bill Reitze and Andy Richard. Eastern New Mexico University: Stacey Bennett, George Crawford, Dr. David Kilby and Ethan Ortega. 2012 Continued Interdisciplinary Research at the Water Canyon Paleoindian Site (LA 134764), Socorro County, New Mexico – Interim Report for the 2010 Field Season and Data Recovery Plan for the 2012 Season. Preliminary Report No. 42 submitted to the NM Historic Preservation Division by the Office of Archaeological Studies, Santa Fe, NM. 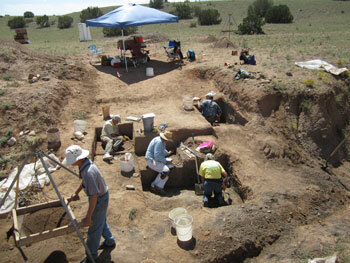 2010	Archaeological Testing at the Water Canyon Site (LA 134764), Socorro County, New Mexico. Interim Report for the 2008 and 2009 Field Seasons. ERG Report Number 2009-09 submitted to the NM Historic Preservation Division by Escondida Research Group, LLC, Santa Fe, NM. 2002	A Cultural Resources Inventory of 472 Acres in Socorro County, New Mexico. The Archaeology of the EMRTC / GLINT Project Area. Report No. 2001-03 submitted to the Energetic Materials Research and Testing Center, New Mexico Institute of Mining and Technology by by Escondida Research Group, Socorro, NM. 2008	Younger Dryas “Black Mats” and the Rancholabrean Termination in North America. Proceedings of the National Academy of Sciences, Volume 105(18): 6520-6525. 2013	Paleoindian Lifeways of the Cody Complex. University of Utah Press, Salt Lake City. 1988	Quaternary Movement Along the La Jencia Fault, Central New Mexico. U.S. Geological Survey Professional Paper 1440. U.S. Government Printing Office, Washington.